One of greatest benefits of straddle carrier crane is their mobility and ability to quickly move from container to container. This speed and flexibility can lead to problems when a crane operator needs to see around his crane during operations, because of the high occurrence of blind spots. 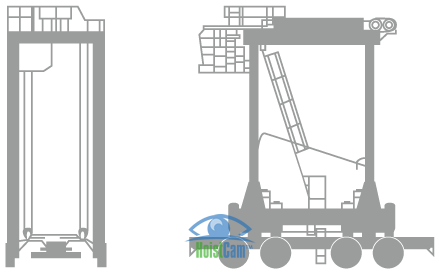 HoistCam™ straddle carrier camera system is designed to eliminate blind spots around the entire straddle carrier. Depending upon the requirements of the straddle carrier, each HoistCam camera system can be supplied with wired or wireless camera feeds and operate using direct power from the crane or via rechargeable battery packs. Wireless, battery powered systems are portable and can be set-up and broken down in minutes, in order to address specific blindspots based on operational need. HoistCam also comes with a remote monitor platform called HoistCam Director. HoistCam Director provides a centralized interface for monitoring straddle carrier operations anywhere in a yard.